19th century Victorian mahogany two-seat sofa with a moulded show frame and serpentine wing back, on cabriole front legs and scroll toes. Upholstery in light blue fabric. Great condition. England, circa 1860 From the private collection of Sir J. Lever. 19th century English Victorian three-seat sofa in black ebonized wood with original brocade fabric from 1890s. 19th century English double seat ebonized wood sofa on brass wheels with original fabric, 1890s. 19th century French carved wood sofa with original fabric. 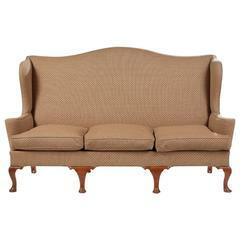 19th century French three-seat sofa with wooden structure and original fabric from 1890s.